Bloomberg Radio called me today to ask what I thought about Warren Buffett's gift of over $30 billion, in annual increments of about $1.5 billion over the next few years, to the Gates Foundation (see article in Fortune). I told them that it should be good news, but it could also have some downsides if not managed effectively. This gift is smart because Buffett did not feel the need to establish his own new bureaucracy to give away his money. He partnered with someone. This is a rare and welcome thing in the philanthropy space. The gift is also admirable because Buffett is requiring each annual increment to be given away in full each year. This means that the money has the potential for having impact more rapidly than otherwise. The gift will be good news if it spurs even more high net worth families to become philanthropists during their lifetimes, rather than waiting until they die. It will be good news if it marks the tipping point toward what Peter Drucker called the new economy of "meaning." Drucker noted that we are entering a period when the binding constraint for many people is not wealth or material goods, but meaning. 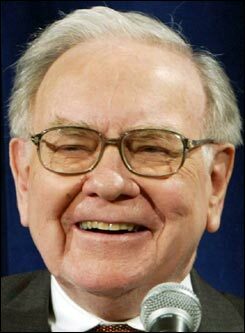 Buffett maintained for many years that he was going to give his money away when he died, but not before. Apparently, he changed his mind after watching how much meaning - call it enjoyment, fulfillment, or satsifaction - that his friend Bill Gates was getting from his work with the Gates Foundation. But the gift could be less than good news if it leads the already huge Gates Foundation to become ponderous, bureaucratic, and top-down. Large organizations and companies face major hurdles in retaining their nimbleness and creativity as they grow. For many years, I worked for the World Bank, which faced many of the same problems. The Bank grew rapidly in the 1970s. When I joined in the mid-1980s, it was filled with exceptionally smart people. But it had an increasingly sclerotic bureaucracy whose momentum kept it from innovating, and whose size and dominance in the sector led to arrogance and isolation from the real world in many cases. Some of the larger, older foundations in this country have suffered from the same syndrome. Let's hope that the Gates Foundation can find a way to avoid the same fate by leveraging the power of partner networks and bottom-up initiatives. That would enable it to be an energetic engine of innovation rather than a increasingly conservative force in the years ahead.